George Payne, Brighton & Hove, BN3 5HB. George Payne pub review, map and rating. Looking for a Hotel near George Payne? Having read good things, we had lunch at the George Payne on a Saturday. All meals were were tasty and decent portion sizes (had fish & chips, chicken and leek pie and a salmon dish) and most were under a tenner. The decor is really nice too and the outside space will be great once the summer arrives. Although we only live 100 metres away this is the first time since the renovations that we have visited. 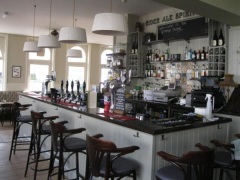 What a great pub, lovely atmosphere, great food and well kept beer, what more could you ask for. Brilliant local pub. Just had an amazing Sunday lunch, very reasonable wine list. Great staff. Great place quality food at the right price and a really good selection of drinks. Gotta love good ales and plenty of good cider :) Open mic night on Thursdays also cant knock it at all keep up the good work guys !! Excellent pub. great atmosphere and great food! Really friendly staff and felt really welcome. Good facilities for families or those looking to chill with mates and the sports although welcome to many in my party weren't intrusive . All in all loved the experience. Still feels like a good ol' local and a fab place to take the family, have a night with the boys or girls or even pop in and sit and have a glass of vino on your own and catch up on your e mails. Visited the George Payne on their opening night. Seems like a vast improvement on the Kendall. Still smelt of paint and all the wall were bare but pleasant enough inside. Excellent choice of ales and some ok looking wines too. There is a south facing garden but didn't go in it. I suspect this place will become popular. Similar to the nearby Ancient Mariner with the exception that the Mariner does awful ale and this place does decent ale!